I was going make a separate post for each item I was creating in prep for our family Easter dinner, but decided to lump it all together in one post. I'm afraid all my holiday posts are starting to look the same! As usual, we are happily hosting both our families for dinner - confirmed for five, tentative and prepping for nine. Place cards are a must for our holiday meals, it helps me out with planning and it shows everyone where they are sitting when the crowd comes into the dining room all at once. I chose that cute little bunny die from Papertrey to adorn each card. I'm also happy to be using the pom pom supply from Christmas. I don't even think I'm through a quarter of the way through my supply yet. Since I'm not very happy with my own handwriting, I tend to rely on my computer to help me in that area. I have a template all set up in Power Point for the 2-3/4 inch by 1-1/4 inch name cards. Just a quick change of font each time if needed, and I'm ready to go! I've attempted a few times to begin a new file in PhotoShop Elements, but I'm just not fast enough yet to whip something out from scratch on that program. Last year I made a wreath using Peeps and loved the idea enough to do it again. I choose purple and yellow this time. In between each 'Peep section' I placed paper flowers that I cut using my Cricut to fill the gaps. 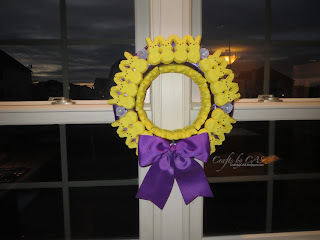 I love these colors together, but I like the way last years turned out much better; I think it's because I decided to go with a smaller wreath form this year. I like the spacing and placement of the larger wreath form. Here are some little baskets I made using the Favor It Box 9 die from Papertrey Ink. My sister loves old shaker boxes, so I thought of her when I saw this die. I filled each one with Easter grass and some goodies. I used the same colors as each persons place card and added their initial to the basket. A few (probably 10) years back Martha Stewart had an online store, Martha by Mail. I loved everything in her catalog - this was pre-Macy's. That is where I found these plastic sugar/butter molds. There are really cute Spring and Easter themed shapes in the set. The sugar shapes could be made in advance. 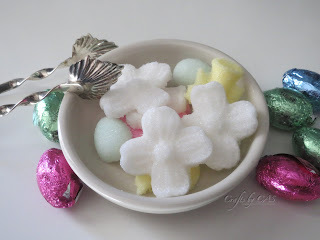 Here's a link from Martha's site on how to make the sugar. I added a drop of food coloring to some of the shapes to add a touch of color. For dessert I'll be making a Banana Pudding recipe I saw on an episode of America's Test Kitchen. (I was going to post the link, but Cook's Country require you to register prior to viewing any recipe - sort of annoying...didn't want to annoy anyone. You can find it by searching "cooks country banana pudding"). I have made this recipe before using the traditional trifle bowl and it was delish. This year I decide to go mini and individual. I found these glasses at Ikea a few weeks ago and thought they were perfect. I'll use them again for sure! I will edit this post after Easter with pictures of the dessert.